The kitchen is the heart of our home, like in many people’s homes around the globe. This is where we not only prepare our food and eat it, it’s a meeting place for our family, where deep discussions are had and our baby’s first steps were taken (no joke!). The kitchen is my happy place, where I can get creative, let loose and just be in the zone to cook up a storm and get a healthy meal on the table for my family. And this means it gets messy quickly! By taking part in the Kitchen Stuff Plus Organization Event, on now in stores and online, I realized that my kitchen had no flow- in the sense that items didn’t make sense in their current placement. Items I needed while cooking weren’t readily available-they were halfway across the room. There was also a lot of wasted space in my cabinets, unnecessary clutter, items I no longer need and multiple packs of the same food because I had forgotten that I had bought some in previous week(s)!!! This collaboration gave me the chance to focus on the room in my home that I used most but had spent the least amount of time giving any thought too. I seriously had not made any changes to my kitchen since we moved in 4.5 years ago. Repeat until your entire kitchen is organized! Small Appliance/Serveware Cabinet: The KSP Curvy Divided Kitchen Organizer was used here for my trays and platters. This vertical kitchen organizer allows for more items to be placed in the cabinet and allows easy access to items. 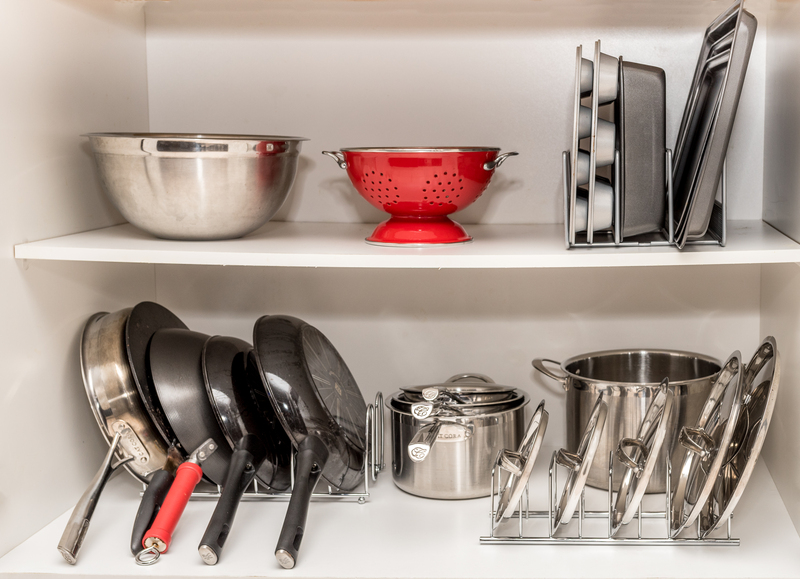 Cookware and Bakeware Cabinet: The KSP Curvy Divided Kitchen Organizer was used for my pans. The KSP Max Divided Kitchen Organizer was used for my cookware lids. The KSP Mesh Divided Pan/Board Rack was used for my bakeware. 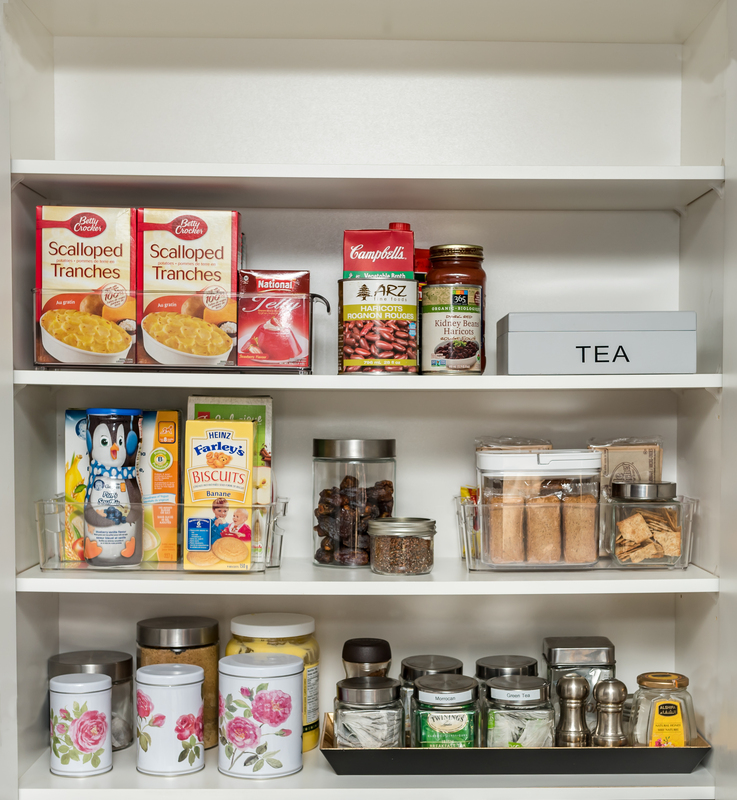 Vertical organization is not only visually appealing, the functionality that each accessory provides is fantastic in creating a clean looking cabinet along with making my life easier in getting things out of the cabinet. 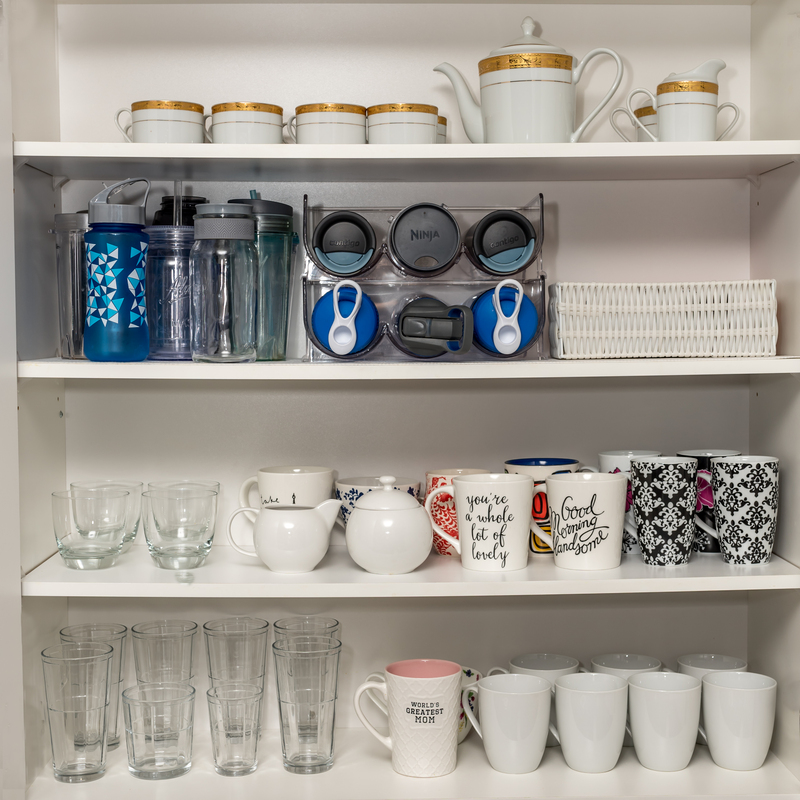 Glasses, Mugs and Travel Mugs/Bottles Cabinet: The InterDesign LINUS Stackable Bottle Rack was used to organize travel mugs and water bottles. I love this organized look so much that I am going to get another set for the remainder of my bottles. Having all the drink ware in one cabinet just makes so much sense! Tableware and Serveware Cabinet: The KSP Space Logic Expandable Kitchen Shelf was used here to add extra storage space to my cabinet. Loving this look because I had previous stacked items on top of each other and it was not pretty. Everyday items were placed on the lowest shelf while our fancy dinner set was placed on the highest shelf because we rarely use them unless we have guests coming over! Spice Cabinet: Bottom Shelf: The InterDesign Linus Stadium Large Spice Rack was used for my everyday cooking spices. Middle Shelf: KSP Mod Cylinder Canisters were used to store my spice overflow. 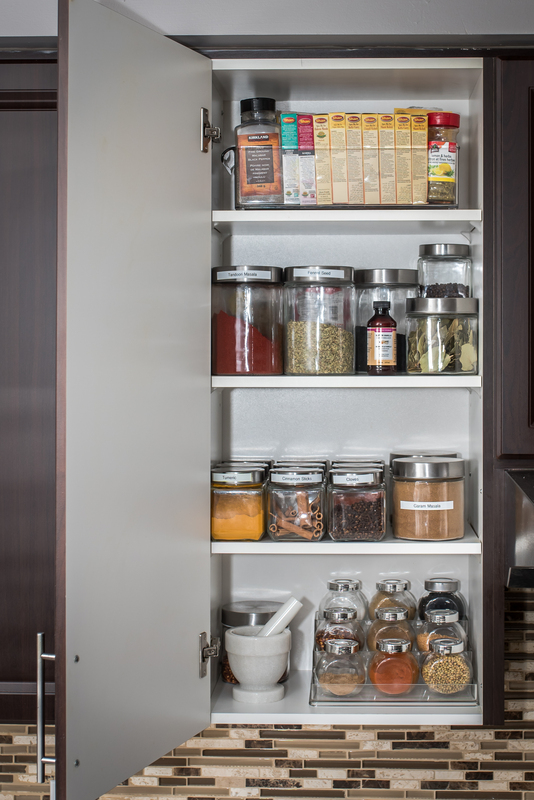 Top Shelf: The KSP Fridge Storage Deep Bin was used to organize spices not used on a daily basis. Spice Cabinet: Labelled some of my jars! Tupperware, Baking Accessories and Everything Else Cabinet: Lowest shelf: KSP Mesh Expandable Kitchen Shelf was used for extra storage space. 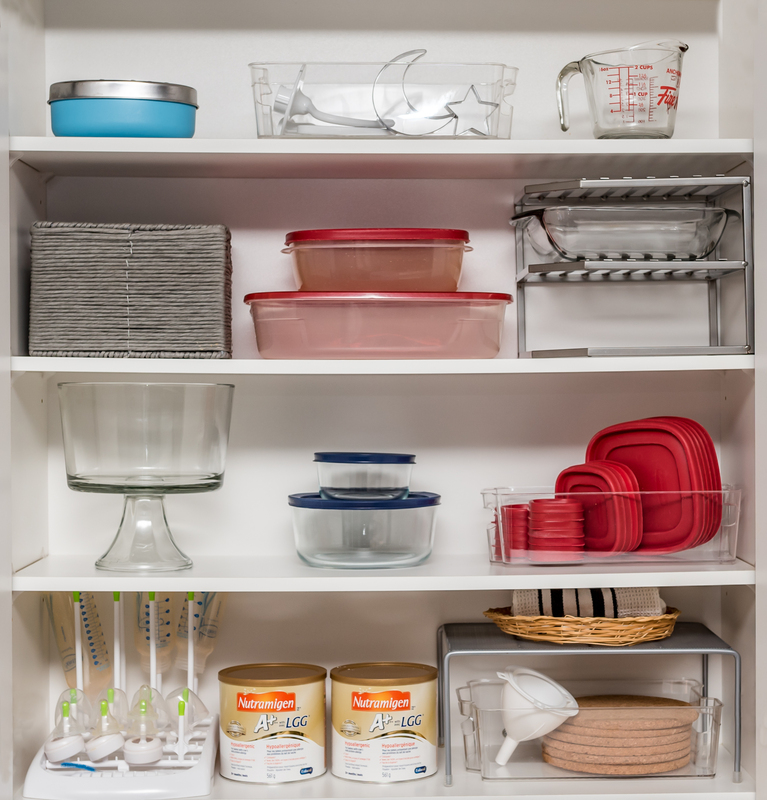 Middle and Top shelf: The clear KSP Fridge Storage Deep Bin was used to store tupperware lids and baking accessories for easy viewing. Third Shelf: The KSP 2-Tier Space Logic Corner Shelf was used here to store glass bakeware. 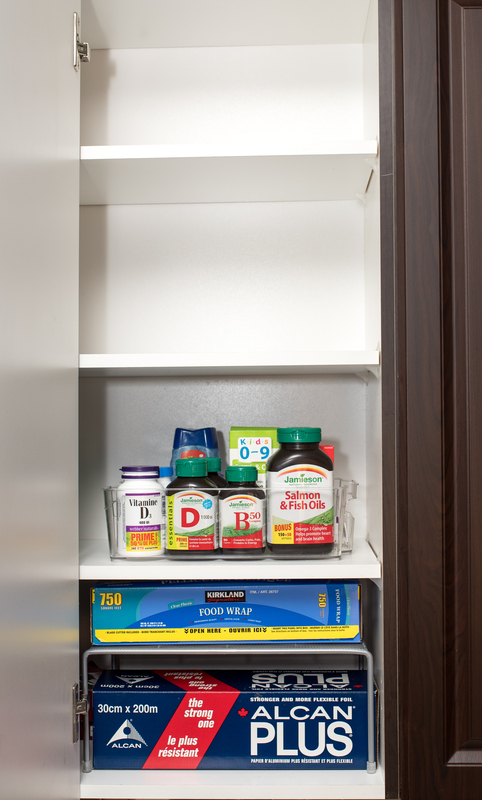 Medicine Cabinet/Food Wrapping Cabinet: The KSP Fridge Storage Deep Bin was used here to store all medicine/vitamins. The clear bin allows easy viewing of items. 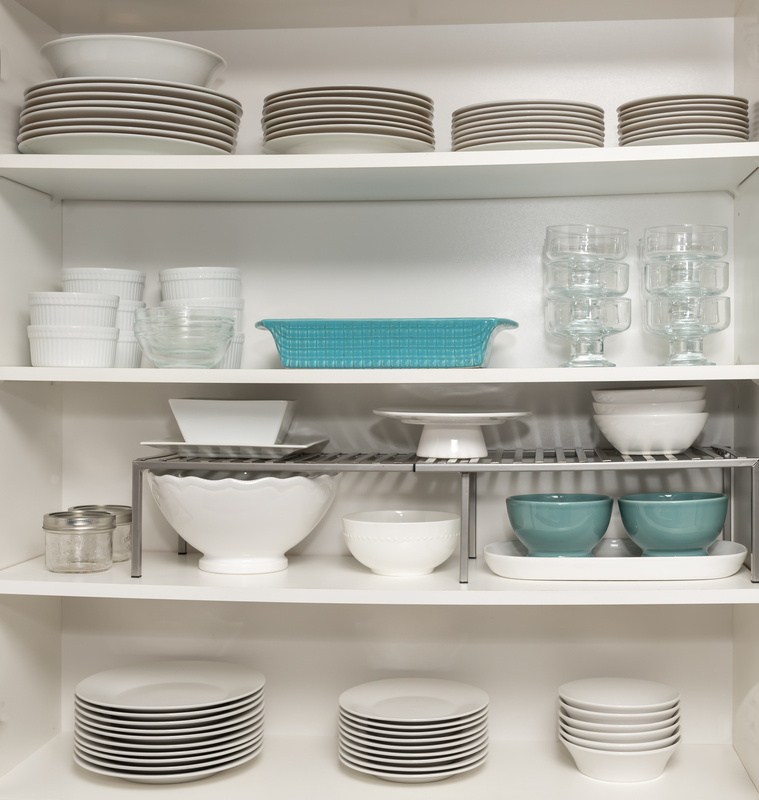 The KSP Mesh Expandable Kitchen Shelf on the lower shelf allows extra storage of food wrapping materials. We have two empty cabinets for overflow. Less is more. Upper Pantry Cabinet: I used the Medium KSP Fridge Storage Deep Bin in the middle shelf to organize baby food on the left and my snacks on the right. I also used a few KSP Mod Cylinder Canisters to store things like dates for my smoothies, tea bags and brown sugar-all the things I need easy access to in the morning! 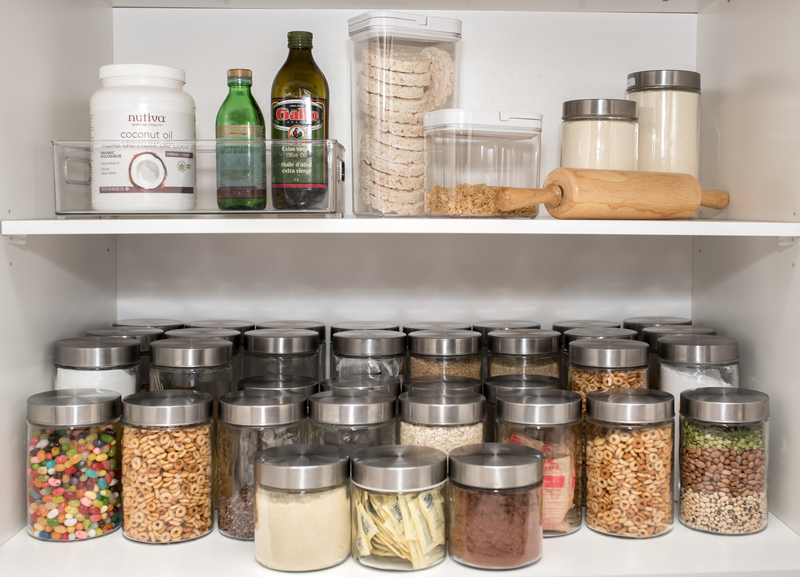 Lower Pantry Cabinet: I used the KSP Easy Lock 3.6L Acrylic Canister with Locking Lid to store rice cakes and the KSP Easy Lock 1.7L Acrylic Canister with Locking Lid to store cereal. On the lower shelf I have organized all pantry items in the KSP Mod Cylinder Canisters. Love the look of this and the clear jars makes it east to locate items. My next step for these will be labelling the jars! I highly recommend taking items out of their packaging and putting them into clear canisters like these so you 1) know when you’re running low on an item and need to restock 2) actually know what you have in your pantry!! When you know what you have, there will be reduced food wastage! Cutlery Drawer. I used the Made Smart Tidy Cutlery Tray here. 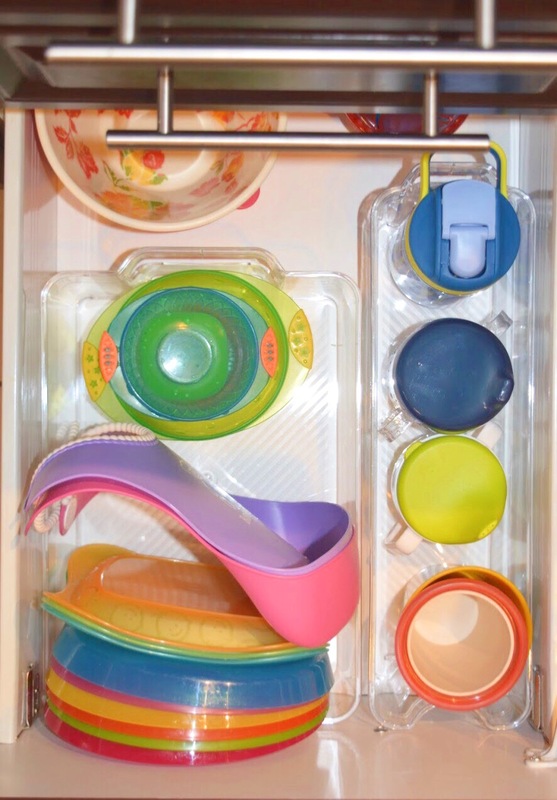 I’ve also used the InterDesign Linus Rectangular Drawer Organizer at the base of the drawer for baby utensils and soup spoons. 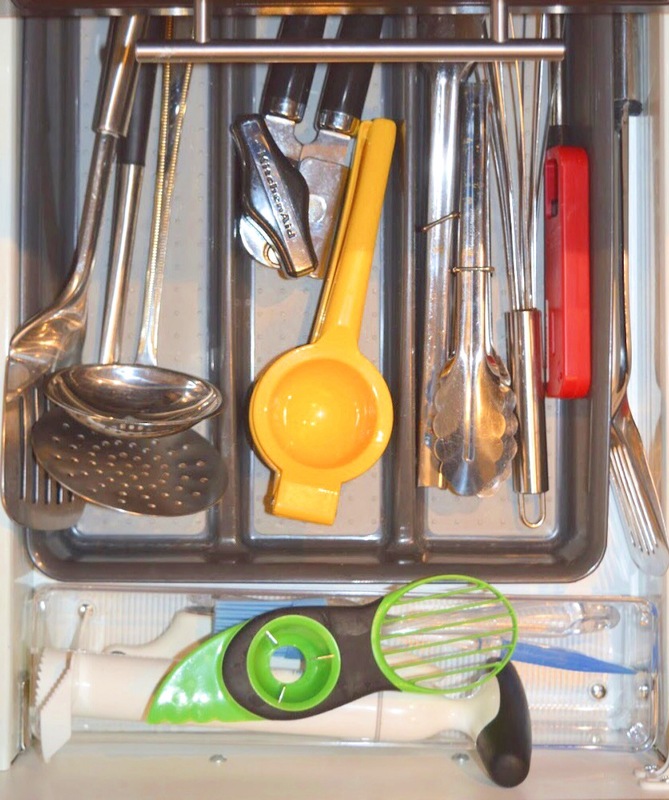 Cooking Utensils Drawer: I used the Made Smart Tidy Utensil Tray (Granite) here to store all of my large items. I also used the clear InterDesign Linus Rectangular Drawer Organizer for extra storage. Baby Drawer: I used the clear Small KSP Fridge Storage Deep Bin for the sippy cups. The Medium KSP Fridge Storage Deep Bin was used to organize plates, bibs and bowls. Baking Drawer: The small KSP Fridge Storage Deep Bin (Clear) was used to organize my measuring cups. 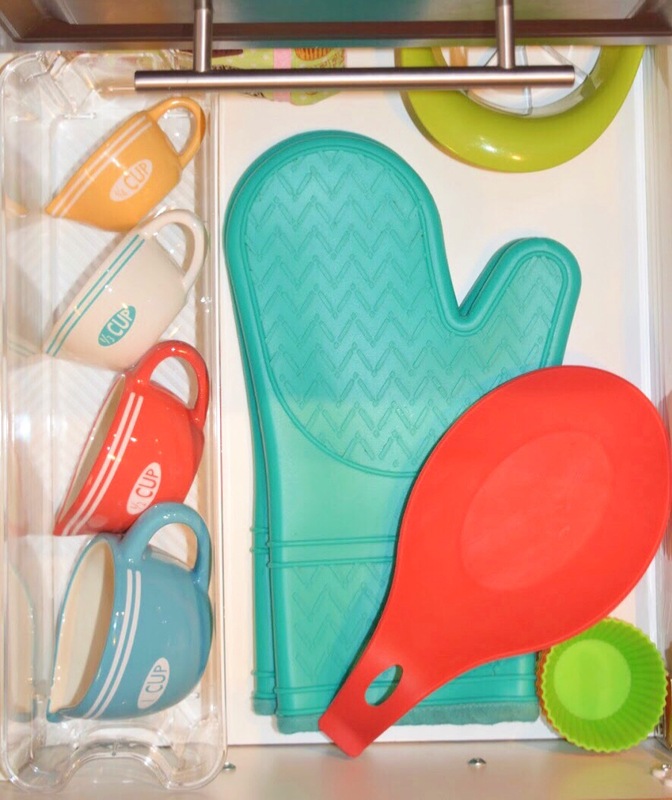 Loving my Kitchen Basics Silicone Spoon Rest, Silicone Oven Mitts and Silicone Baking cups! That’s our new organized kitchen! 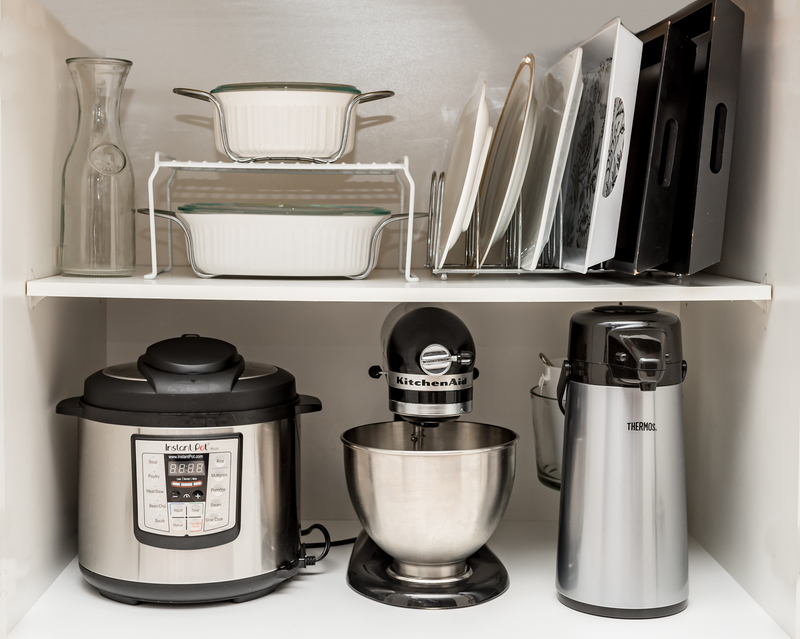 Now it’s time for YOU to get busy organizing your kitchen! A little backstory for you all: One day I was at home with the kids and I hadn’t gotten a chance to pick up the traditional roti we usually pair with our homemade curries (Hi, my name is Tabassum and I cannot for the life of me make a round soft roti so I gave up for now lol) and my kids were HUNGRY. So I was picking my brain on what vehicle to use with the curry to feed the kids. Then the lightbulb moment happened: I had Furlani Garlic Toast! I quickly popped a few pieces into my oven and within 5 minutes dinner was ready! The kids gobbled up the curry and garlic toast and were really happy doing so may I add! That night I put the kids to bed and taste tested this out myself…and guys, we have a winner!! The thickness of the bread is perfect to sop up delectable curries and the subtle garlic bread added another element of flavor to overall dish! And so, ladies and gentleman, I present to you: Fusion Vegetable Curry with a side of Furlani Garlic Toast! ● Once the potatoes have softened completely, the curry is complete! I hope you will try out this vegetable curry recipe with a side of Furlani Garlic Toast! You won’t be disappointed. This past Ramadan I whipped up meringues for charity. It was a humbling experience and the outpouring of support from my followers was incredible, for which I am so thankful. However, due to all of the orders that came in, I didn’t get the chance to gift any meringues to my friends or family! So this Eid, I made them mini Swiss meringues. After careful research, I discovered that Sugar Art Canada (@sugarartcanada) offered Eid Meringue Sugar Transfer sheets. They were kind enough to send me some samples to test out! Thank you Sugar Art Canada! Basically, in place of parchment paper on the baking sheet, you place these meringue transfer sheets and pipe the meringue onto it. In the process of baking, the stamp transfers onto the bottom of the meringue. Pretty cool! I have a special surprise for you all: Sugar Art Canada is offering you all a 10% discount when you use code ‘Kash10’ at checkout. Full disclosure, I will receive a tiny commission from each sale. I’m so excited that a product like this exists and that we can now get customized Eid products to make our celebrations a little more festive! We love soups in this house and one of our favourites is this lentil soup! It’s healthy, delicious and packed with a ton of protein! Soups are a great way to fill up without that heavy feeling. One of the key things I did to lose weight over the course of many months, was to implement soups into my diet at least four times a week. This really helped me curb my craving pangs and focus on my goals. While the final result of the soup is indeed yellow, I actually used RED lentils for this soup! We did add a bit of turmeric which has an abundance of health benefits and gives this soup the vibrant yellow shade. I used the Instant Pot for this recipe but you can easily make this on the stove top too. Chop up the onion and set aside. Crush the garlic cloves now if you are using fresh garlic. Plug in the instant pot and hit the Sautee button. Once the instant pot says "Hot" add in the onion and mix. Once the onions are golden brown, add in the garlic and mix. After a minute add in the lentils and mix. Add in the vegetable stock and the spices now. Mix well. Hit the cancel/off button on the instant pot. Put on the lid of the instant pot (making sure the valve is pointed to the centre!). Hit the multigrain button and reduce the time to 10 minutes. The instant pot will take 15 minutes to pressurize. Once the instant pot is done cooking it will beep. Carefully turn the nozzle and release the steam. Open the lid and mix the lentil soup. Enjoy a healthy and delicious meal! Serve with a crusty bread or with nachos as I did! Keema Mirch, which translates to ground beef and bell pepper curry, is one of my childhood favourites! When it comes to the best keema mirch recipe, I’ve had my fair share from my mom’s homeade to picking some up from a local restaurtant. And the truth is, there’s no singular authentic recipe. They’re all tweaks and variations. But today, I’ll share with you my tried and true keema mirch recipe that always brings my family back for seconds. A simple and hearty meal to end the day with! Begin by chopping up all of the vegetables. Dice up the onion and set aside. Cube the tomato and set aside. Dice up the green bell pepper to be used later on. Turn on your stove to medium high heat. In a medium sized pot, add in the vegetable oil and onions. Give the onions a good stir and let them cook for 5-10 minutes, stirring occasionally. The onions should be golden brown/dark brown (but not burnt!). Add in the tomatoes and stir. Wait for the tomatoes to simmer down and then add the spices (everything except the ketchup). Stir this mixture and allow to cook for 2 minutes. Keep stirring. Now add the ground beef to the pot. The meat will take about 5-7 minutes to cook through. Keep stirring during this time. Add in the chopped green bell peppers, mix and cover the pot with the lid. Cook on medium heat for about 7-10 minutes. The keema mirch is done! Garnish with green onions and serve with brown rice. I hope you’ll try out this recipe! Let me know your thoughts by tagging me @kashmirifoodie on Instagram.